Gamers of a certain age will remember that the PC used to be the home of many a classic space combat game. X-Wing, TIE Fighter and Wing Commander were among the most famous (and you’re surely aware by now that the latter’s creator has a new project), and even the X-COM series had a crack with X-COM: Interceptor. 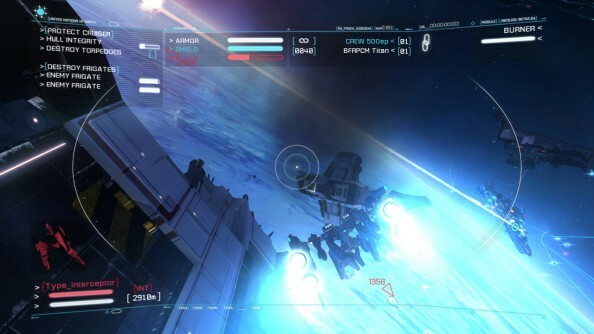 Sadly, the genre fell into decline and was almost forgotten, but Guildford-based Born Ready Games aims to change that with Strike Suit Zero, a title that mixes space combat, giant robots and some of the biggest starships you’ve ever seen. 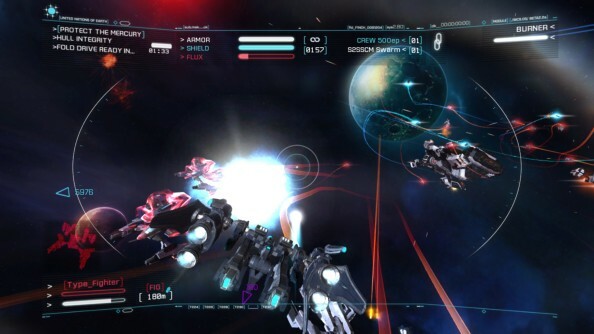 Strike Suit Zero drops the player into the midst of enormous and incandescent space battles. 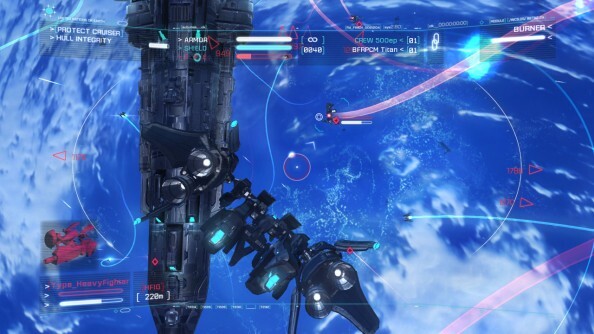 Gargantuan capital ships crawl lazily through the blackness as fighters streak between them, dogfighting or making strafing runs, while the player sits at the controls of a craft powerful enough to tip the balance of the battle. Earth’s future is at stake and its your job to fight off wave after wave of enemy fighters and take apart their capital ships piece by piece. The titular Strike Suit put at your disposal isn’t simply another bigger and slightly beefier fighter craft, it’s also a vessel capable of transforming into a giant robot at the flick of a switch, a metamorphosis that makes it a very different engine of war with its own separate control method and special abilities. While a fighter craft can bank and yaw, a Giant Space Robot (the correct term, I believe) can sidestep and weave its way through a dogfight in third-person. 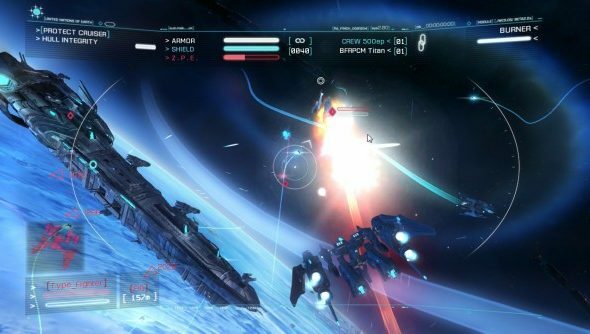 James Brooksby, CEO of Born Ready, says this was because the team wanted to bring something different to space combat, and not merely echo the classics of the past. Adding a new combat craft with a new kind of control scheme wasn’t just about changing the way that dogfights were fought, it was also an opportunity to give players control of something a little bit special that had “the ability to truly take people on” and that Brooksby says is “devastating” in its ability to suddenly transform and flip 180 degrees, sidestep its way out of enemy fire and blast off a volley of missiles. As we mentioned last week, Strike Suit Zero is enjoying a very healthy Kickstarter campaign, although it didn’t begin life as a crowdfunded project. The game has been in development for well over a year and the Kickstarter funding is only needed to see it through to completion. At the time of writing, the campaign has gained considerable support, already raising $89,000 of its $100,000 target. With over two weeks to go and thousands of dollars arriving each day, it looks like Born Ready will more than match their target and will have an enthusiastic audience when the game is released. Not bad for a game in a largely forgotten genre. But the relative obscurity of space combat games doesn’t bother the team. Brooksby says that, while publishers claim that space combat games are “niche,” those niches can still be large enough to attract a considerable audience, particularly if publishers aren’t part of the equation and developers turn to digital distribution. 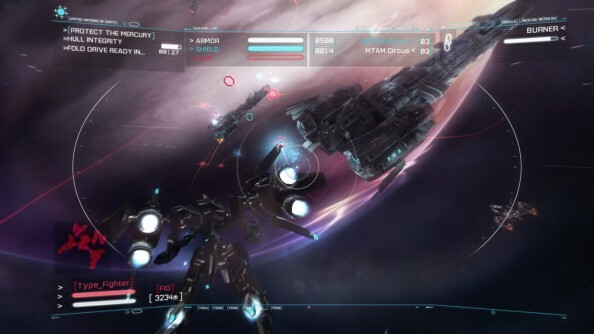 “The space combat market is limited. I think it’s perfectly fair to say these things,” he says. “It’s niche, but it’s big enough for us, as independent game makers, who can reach the customers direct. There are loads of opportunities to reach people directly, so we’re seeing what were niches doing really, really well.” And, he adds, sometimes games break out of those niches, reminding publishers that they shouldn’t draw broad conclusions. I’m not entirely sure that space combat ever was a niche or a minority interest, but I have to concede that, all those years ago, we somehow left it behind. Regardless of whether that niche ever really existed, or still does, it looks like Strike Suit Zero is well on its way to finding its audience. The game enters beta later this year and is slated for release in early 2013, so you have a few months yet to prepare to save the earth.